The 2015 Audi TT is set to make its market debut later this year, and ahead of that, Ingolstadt has revealed the new two-door sports car’s interior, previewing it at the ongoing Consumer Electronics Show in Las Vegas. 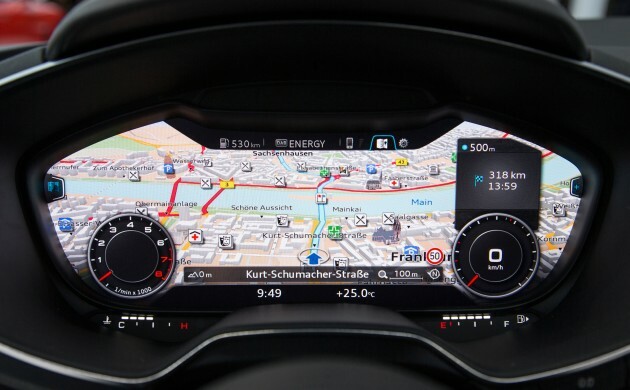 The Mk3’s interior has been redesigned from the ground up, with an Audi virtual cockpit leading the way – the fully digital instrument cluster, equipped with a 12.3-inch TFT monitor, displays all the information directly in front of the driver, so there’s no longer a need for a central display. Drivers can switch between two display modes – a ‘classic’ view, where the speedometer and rev counter are in the foreground, and an ‘infotainment’ mode, where the virtual instruments are made smaller, offering display space for functions such as the navigation map. Seen from above, the instrument panel resembles an airplane wing, and the round air nozzles are reminiscent of jet engines. The AC controls are housed in the vents, with adjustment functions for seat heating, temperature, direction and strength of air flow located in their axes, the settings indicated by small displays. All elements of the new car’s operating concept, the automaker says, are focused on the driver. A new multi-function steering wheel features a flat-bottomed rim, with aluminium-look clips framing its spokes, with the mounted switchgear offering control over almost all functions, including the ultra-modern infotainment system. The menu, meanwhile, is structured to reflect that of a smartphone, and includes a full-text search function, or MMI search. The MMI terminal located on the centre tunnel console, the second control unit alongside the steering wheel, has also been redeveloped – MMI touch means the driver can scroll and zoom in on lists and maps, and simplified access sees the use of just two rather than four button-operation in the area surrounding the rotary pushbutton. New too are the S sport seats, with significantly curved side bolsters that can be adjusted pneumatically, and the redesign work also sees a centre tunnel console that offers support for the lower leg during spirited driving. The third-gen TT, which will sit on the Volkswagen Group’s flexible MQB platform, promises to be lighter and more dynamic than before, be it in front-wheel drive or quattro form – in terms of engines, a 180 hp 1.8 litre TFSI should form the baseline model, followed by 2.0 litre TFSI and TDI variants, which will offer 220 hp and 150 hp respectively. stupid dashboard. not ergo at all. pls learn from bmw. navigation screens got be as close to your eye level as possibly to reduce the time for your eyes off the road. navi is not the same as speedometer. u can glance at speedo, but u take longer time to look at navi. real stupid design. do the audi engineers really have a degree? The people at Proton can’t even IMAGINE it this. Instead, they can only imagine SV versions of cars to cut cost, or to the opposite of that, just re-badge. So, technically there is no independent MMI display? It is very common in other countries where manual transmission is standard equipment except this country, where S-tronic is the sole transmission (unless you strongly request special order for manual transmission). Yep, especially in Europe. Manual transmission is still the preference for cars offered in manual and auto. Faith in ‘hardworking drivers’ restored. Didn’t Audi also introduce a tablet? Wouldn’t it be nice if that has a dock in the center, and it can be taken out so the passenger can easily control certain features, like the GPS or the entertainment system? much better than the current one, it will b great if there is a look up display for the sat nav. always hate “chick” tt ….but got to gave props for the manual cred!! I like that gimmicky temperature display at the aircon vent, looks cool. At long last, a proper 2-doors sports car with 6MT. but why not they use RWD layout? Audi TT is an FF layout sports car from its debut in last millenium. If you want, you can opt for TT-RS. This variant has Audi Quattro AWD but not rear-biased as in Audi R8. Do you know that majority of the cars in Europe are in manual transmission? Even both older TT are also available in manual transmission. Correct. And notice this, everytime there is any facelift or full model change, the manufacturers will say manual transmission is standard across the range (expected to be globally except this odd country) while S-tronic (DSG) is an optional equipment. All futuristic display panel should be like a computer by now. Audi started first, let us see who is the next clever guy’s in normal stock car production? By using a computer the links are endless! Just imagine it diagnose the vehicles and at the same time online with all around the world! Safety, security and reliability driving info at a split of second in our mind to know. Audi of late, makes some of my favorite dash design in the industry. This and the A3, Simple, and yet purposefully elegent. Well done Audi, Vorsprung durch design. i know its subjective, what i can tel you Audi interior is kinda expecting and nothing to shout about or in other words boring. And it also subjective that I say I am not a fan of Mercedes interior on some models, the A/CLA/GLA in paricular, I do love the S-class and new C-class thou. I am not a fan of organic design which is why I do not like hyundai’s fluidic design and the previous Vios/Yaris’s dugong style.For me, sharp and edgy but importantly simple design favors this eyes, from the Kia K5, to the Sydney Opera House. Personally, organic shape rarely succed but when they do, they are amongst the best ever, que in the Eagle Jaguar and Ferrai 250 SWB. As far as styling goes, I read somewhere thaat it is a very subjective manner, in the sense that it pisses people of when they do not agree akin to MU vs Chelsae fans, Naruto vs Bleach fans, NATO vs Warsaw pect weaponary fans. they both are bloody similar and offers the same pupose. But sadly, just because of subjective taste it brings in fire. Saying that I better bring in my fire jacket for the amount of dislike. Nice dash they got there. The renders of the next gen TT isn’t shabby either. I think having the SatNav on the dash is impractical and dangerous IMO, there’s too much information will take the driver several second of his/her time that supposedly use to eyes the road just to look at the display. Mind you several second is a disaster especially at high speed..better display it conventionally (center console). Hope it has HUD too. Awesome! The speedometer+LCD screen design is crazy. If the driver keep looking at the GPS map instead of focus on the road, i’m sure he will crash into something in front. But it’s still better than looking on the centre of the dashboard,right?? Just one word for the exterior spyshot, WOW! With that large rims, really an eye-catcher. The interior for me, something special from Audi. Its great actually.